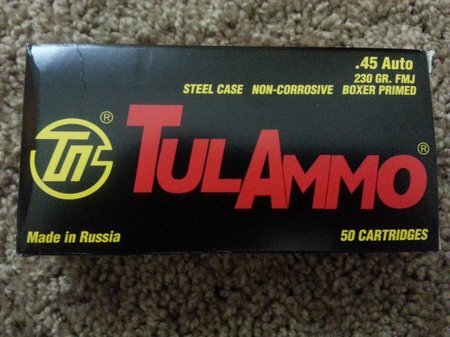 Tulammo ammunition is manufactured by Tula Cartridge Works located in Tula, Russia. It was founded in 1880 and is one of the largest ammunition plants in the world. They have to be doing something right if they can stay in business for 125 years right? 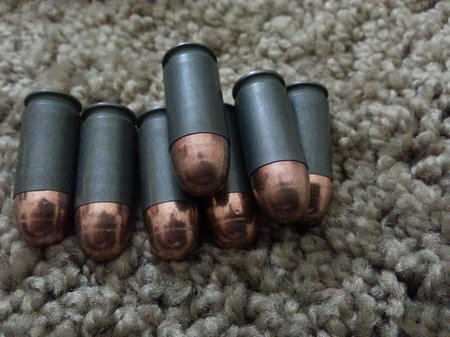 Tulammo 45 ACP ammunition can be used for target shooting and/or combat situations like SHTF scenarios. Various handguns were used for testing purposes by Tula Cartridge Works. They were the Glock 21, Sig Sauer, H&K and the 1911 pistols. This ammunition complies with CIP requirements. Tulammo 45 acp ammo is loaded with polymer coated steel cases and either copper or bimetal bullets. The steel cases are soft or annealed to allow the case to expand upon firing, filling the chamber. The steel cases are much softer than a gun barrel and will not damage the barrel. The polymer coating prevents corrosion and provides smooth feeding and easy extraction. The polymer coating will not melt or accumulate in the chamber and cause sticky extraction. This is a myth. Lacquer coatings do not melt or cause extraction/ejection issues either. 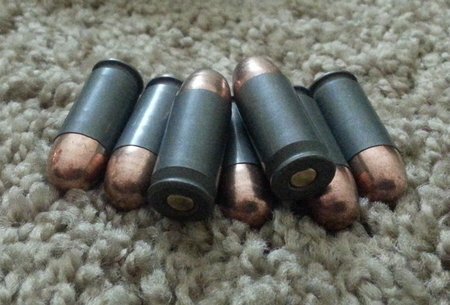 Bimetal bullets have jackets made from layers of soft steel and copper. The core of all bimetal bullets is LEAD. Only the jackets are steel and copper. The steel and copper jackets are soft and will not damage gun barrels. 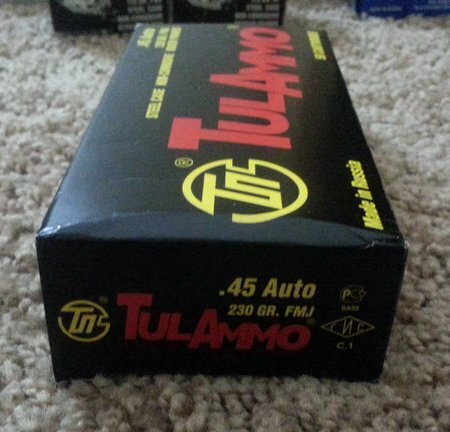 Tulammo 45 acp ammunition has non-corrosive primers and powder. The primers are boxer type. I really like the dark cases….it won’t give away your position. 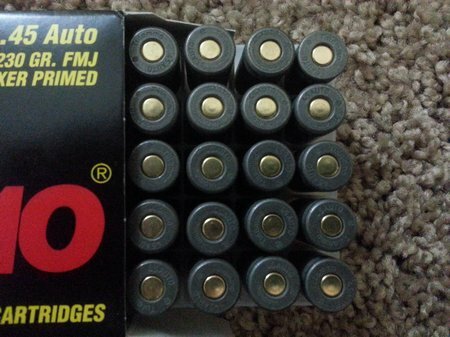 Tulammo 45 acp ammo is loaded with 230 grain FMJ bullets at a muzzle velocity of 850 fps. The maximum pressure is 19,900 psi. 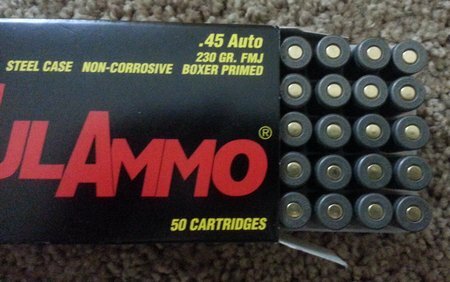 Tulammo ammo may seem dirtier than other ammo but let me explain this. It’s not dirty ammo and in fact the powder used in Tulammo is very clean burning and efficient. There will be more powder residue in the firearm because of the steel case. Steel cases do not expand as well as brass cases and therefore do not seal the chamber like brass does. And so gases escape past the case and into the chamber and action. This is why people say it is “dirty”. You will also notice that the residue is easier to clean than other ammo. It wipes off easily.